Jesus was human, like you and me. If the Gospel is true, he still is. It's the easiest Sunday School answer in the book: Jesus is God. But do we really grasp the reality of Jesus' day-to-day humanity as his disciples experienced it firsthand? And if not, could it be that we're only seeing half the portrait of who our glorious God is? Through eye-opening yet down-to-earth reflections, Jesus Journey takes a fresh, insightful look at the defining relationships and events in Jesus' life and how they might inform our own. Join Pastor Trent Sheppard as he shines a new light on the astounding humanity of the historical Jesus through an up-close look at Jesus' relationship with his mother Mary, his heavenly Father, and the disciples who were his friends, as well as how the Passion Week formed this God-made-man, and after that-the resurrection. From his humor, his breakfasts on the beach, his hiccups (just like us), you will see the face of God in a new way. Come encounter the human who radically transforms our view of God, and the God who forever changes what it means to be human. It will challenge your assumptions. It will shatter your stained glass image of who Jesus really is and was. And it will reveal a full-color, wide-screen view of the most influential person in human history, illuminating what it means to be a disciple today. 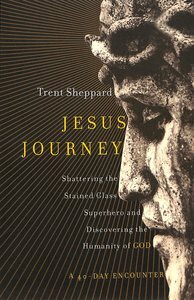 About "Jesus Journey: Shattering the Stained Glass Superhero and Discovering the Humanity of Christ"
Trent Sheppard is a teaching pastor at STATUS church in Orlando, Florida. He travels widely to speak with students about the life of faith.